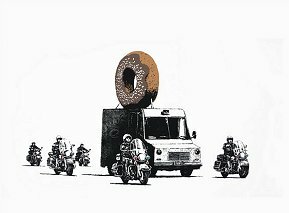 Banksy has captured the world's attention and held it since the late 1990s, when his controversial stencilled artworks rose to fame and transformed him into Britain's most celebrated graffiti artist. 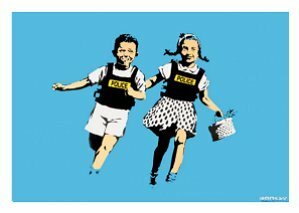 Banksy seeks to remain anonymous, but varying reports bring up two different names: Robert Banks and Robin Gunningham. 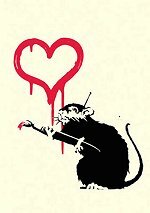 It is believed that Banksy was born in Bristol circa 1974, 1975. 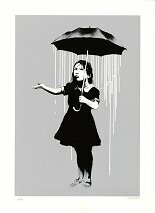 Dark humour, satire and his distinctive stencilling technique characterise Banksy's renowned social and political commentaries. 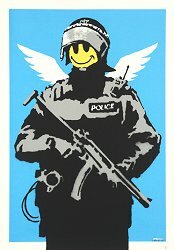 Striking images and slogans immortalise his satirical critiques of politics, war, capitalism, hypocrisy and greed, which often include apes, rats, policeman and children. Back in 2006, Banksy even incorporated a live elephant into one of his pieces. 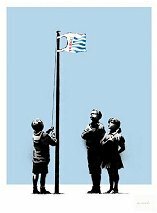 Limited editions of Banksy prints, which have now morphed into private collections from public walls, are in extremely high demand and continue to generate huge interest at auction. 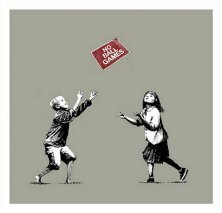 Banksy collectors are reported to include Damien Hirst, Brad Pitt, Angelina Jolie, Jude Law, Macaulay Culkin and Christina Aguilera. © If artwork shown on ArtFair is already sold or unavailable for immediate sale, we'll do our utmost to source a similar edition for you. ArtFair is a trading name of LeadFair Ltd. Co. Reg. Number 08565869. Reg. Address: Swift House, 18 Hoffmans Way, Chelmsford, Essex. CM1 1GU. Registered in England and Wales. VAT Reg. No. 169725662. Registered with the Information Commissioner's Office: Data Protection Reg. No. ZA025012. Artwork prices can go up or down. ArtFair offers fine art, contemporary art, urban art, pop art, and modern art through our own collection and our global network of art gallery partners, art dealers and private collections. 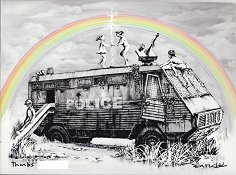 Keywords: Banksy Art For Sale, NOLA White Rain, Jack and Jill Police Kids, No Ball Games Grey, Banksy CYW, Choose Your Weapon.